Not many people know how great comfrey is in the garden. 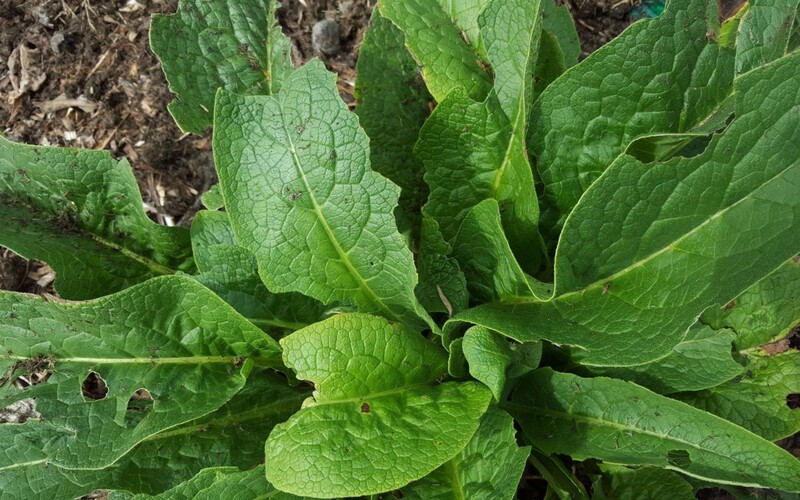 Comfrey helps to provide nutrients for your soil and the leaves are great for the compost heap as comfrey’s quick rotting leaves work with bacteria and soil organisms to help speed the composting of dried leaves and other high carbon materials. We plant comfrey in all of our garden beds because the deep tap roots help to break up our heavy clay soil. Where other plant roots can’t reach, comfrey roots are known to go down 3 meters deep where they pull magnesium, potassium and calcium up to the leaves. We find the ‘chop and drop’ technique is very easy and effective. Cut and lay the leaves directly around your plants as the high nitrogen and potassium content becomes available to crops almost immediately. Please note that high nitrogen fertilizers are not a good match for leafy crops such as lettuce and spinach as the nitrogen boost can cause them to bolt to seed prematurely. It is also not a good match for rooting crops such as carrots. But feel free to use comfrey leaves on your fruit trees and other flowers and vegetables around your garden. We also like to make ‘comfrey tea’ by adding water to the cut leaves and letting them soak in a closed bucket for a month. We then dilute it by about 50% and use it as a side dressing on all of our plants every two weeks. You can also spray the diluted comfrey tea on leaves which has been found to slow the growth of powdery mildew spores on plant leaves. Transplanting comfrey is very easy as the root grows extremely well by being divided. We wait until the plant is about 50 cm in circumference and then dig into the roots to break a chunk off and transplant it to another bed or put it in a pot to get strong before transplanting. We have found they will have new growth in as little as one week. We’ve discovered it isn’t easy to buy comfrey plants, so if you know someone that has a comfrey plant, ask them for some root stock. One plant will become many in no time using the method mentioned above, and your garden will thrive from the nutrient rich leaves and long tap root which will help to improve your soil. 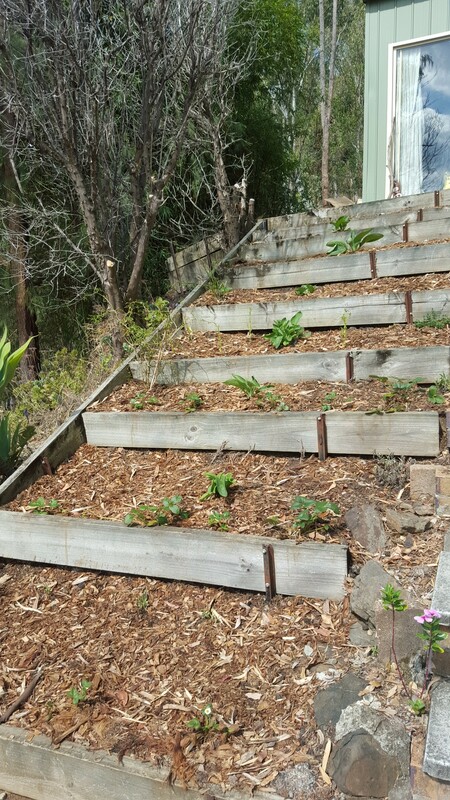 The first thing we did to prepare this bed was to plant comfrey on each level. 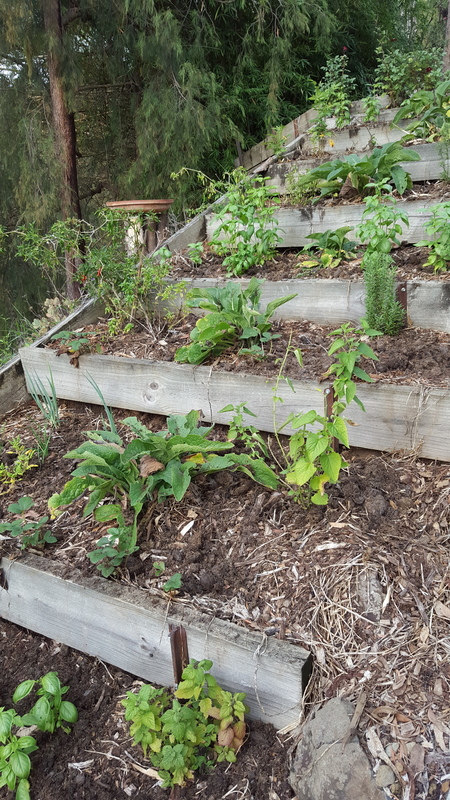 This is the herb garden four months after preparing the bed with comfrey. We find comfrey is one of the most valuable plants for conditioning soil and adding nutrients to our plants so we get the best results from our garden.